An article about the glow plug's history, from its origin to today. Diesel glow plugs were born in the far 1929 to aid diesel engines starting. First glow plugs were very basic, a very thick with high temperature capability wire rolled up in one or few coils were used as a resistor. They were usually low voltage glow plugs, connected by a serial connection. The glow plugs were very slow, and exposition to combustion gas shortened their life, also if one of the glow plugs burnt-out the entire circuit were interrupted and the good glow plugs completely useless. The diesel engine technical evolution needed faster and more reliable glow plugs able to work with higher voltage and supplied by a parallel connection. The answer was the sheathed glow plug, where the resistor was made by a thin wire rolled into many coils, put inside an iron tube welded to one side and filled with insulating powder. The tube were then forced inside an iron body like the old glow plugs with external resistor. It was the end of the 1970, this glow plugs put down the basis for the modern manifacturing technology still used today, even if improved. 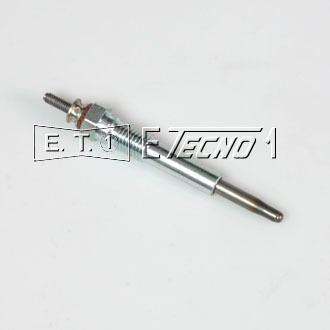 This kind of glow plug had 6mm diameter tube, were used on european vehicles, and revolutionary starting time, 17 seconds. In the '80s glow plugs and engine manufacturers focused on speeding up pre heating systems, in these years the super fast glow plugs were born, with stunning performance, able to start-up a diesel engine after less then 10 seconds. It's interesting to note how the japanese glow plugs were developed, using 5mm tubes instead of the 6mm used in european glow plugs, an innovative technology very used also by european manufacturer in later years. In the last '70s a new innovative technology showed up on the market and changed the diesel glow plugs forever. 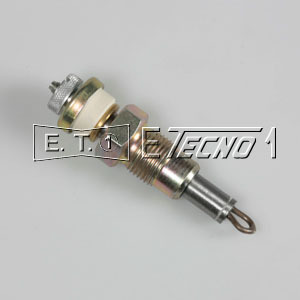 Untill now the internal coil was made with a single wire, also called monofilament glow plugs, made by nickel. Now Beru, the first and main glow plugs manufacturer developed a new patented concept, they put two serial resistors inside the tube, the first one, called regulation coil, made with a ptc material able to increase its own resistance wgile temperature increase, the second resistor made by an alloy able to to high temperature resistence. The new glow plugs were able of starting up a diesel engine in seven seconds and keep that temperature for longer time then the monofilament models. In the first '90s european community enforced new regulation to limit pollution emission by vehicles. According to the new regulation the glow plugs should have been started for a preheating phase then stay warm for a longer time, about 90 seconds, to aid the engine in a better combustion when cold. The new system, called post heating, was very successfull in limiting the pollution emission, but was very hard demanding for glow plugs. All manufacturers had to find new technologies to match the new regulation demand, double filament glow plugs were the immediate answer, due to their attitude for this kind of working conditions, but the beru patent gave limited access to this technology, so many manufacturer applied new alloys and new manufacturing process to monofilament technology and were able to have monofilament glow plugs with very satisfing post heating technology, covering the performance gap between monofilament and double filament technologies. The japanese solution to the new pollution regulation problem has been quite different from the one adopted by european engine and glow plugs manufacturers. They called it QGS (Quick Glow System), where the glow plugs were simple low voltage monofilament glow plugs without any temperature regulation capability. The relay unit was the system's core, able to survoltage the glow plug at 12V for a very short pre heating time (about 3 seconds) and then lowering the tension applied to 6 volts to keep the glow plug warm for a longer post heating time. 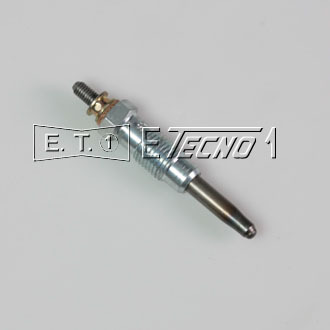 The RD28T, Nissan Patrol's engine, fit six ceramic glow plugs of two different kind, three for each model in a set. The two relay control unit connects in parallel the two sets while in preheating phase, then switch to a serial connection for the post heating phase, at this time the voltage applied is half the battery voltage. Neverless, this sistem where not exempted from troubles, the electric plant was quite complicated, the two ceramic glow plugs very expensive, and the control unit with two relais was common to fault after many kilometers having the glow plugs to burn out. It was the second half of the '90s, all glow plugs were used in prechamber diesel engines, where the glow plugs and the injector were fit inside a prechamber inside the engine head. Here the injected diesel fuel exploded then the high temperature gas expanded to the cylinder moving down the piston before being ejected by the exaust valve. Around the year 2000 the new projects of silenced, lighter, small direct injection engines showed up on the market, equiping all the new diesel vehicle, and not only the heavy and big earth moving and trucks like in the past. The new generation of turbo diesel engines was born, and in the next future equiped with common rail, jtd and other high pressure injection systems, pushing diesel engines to new frontiers. Even if direct injection diesel engines were able to start by air compression and without glow plugs , they were always usefull to aid in starting with very cold outside temperature, and to limit the pollution emission. Glow plugs moved their role from preheating to postheating resistors, warming up after the engine start and to aid start up only with very cold temperature. Now glow plugs were fit inside the cylinder, and no longer into a prechamber, the working condition were quite different, so the new direct injection glow plugs were different as well, with a 5mm heating tube (like the one already used by the japanese manufacturers), often with a tapered tip to 4mm diameter, for a smaller profile and limit turbolence in the combustion chamber. They were also longer, to fit into thicker engine heads needed to limit rumors and resist the increased pressure. 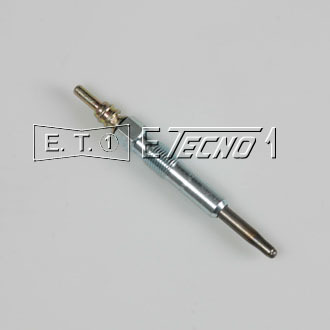 The new glow plugs had post heating capability, and able to work at higher tension, up to 14V. From the 2004 on, a new thiner glow plugs slowly replaced the old 5mm. The new one had a 4mm or 4,4mm tube, and a thiner body then the other models. The new thiner, longer models with post heating capability and tapered tips down to 3,5mm, were specifically designed to work on high pressure injection systems, such as common rails and jtd. On the other side of the world, in Japan, the diesel technology follows and sometimes outrun european engines, and the already thin glow plugs become more thin once again. Japanese manufacturers, uses the ceramic technology instead of the nickel-chrome alloys in the tube, including the 3mm thin ceramic tube inside a second shorter tube in order to leave the tip out, and forcing the assembled tubes inside an iron body. Even if the ceramic tube is not used, diameters are still thin and the double tubes used. 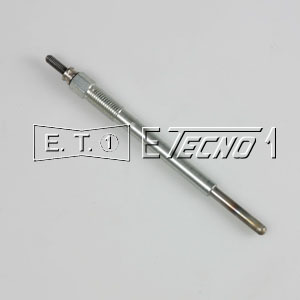 Glow plugs have post heating capability from a long time, as the european do, and the use of complex electronic left from a long time. The japanese glow plugs are indeed superb engineering work. Istant Start System (ISS) is the latest glow plug technology applied to diesel engines. To be honest it's about the same old QGS concept but with new modern electronic technology. 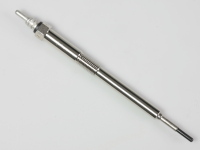 Glow plugs are designed for low voltage working condition, they're given a 12V-13V tension for a couple of seconds, then kept warm by a low voltage tension or by 13V spikes. Each glow plug has a unique supply line, and a sensor telling the control what's combustion chamber temperature. The pre-post heating glow plugs are also used to optimize the combustion, avoid engine vibrations and unbalancing while the engine runs. A new evolution called ISS second generation includes a resistor flange to warm the air entering the cylinders and aid in a better combustion and less pollution emission.